Revolution Slider Error: Slider with alias botb not found. 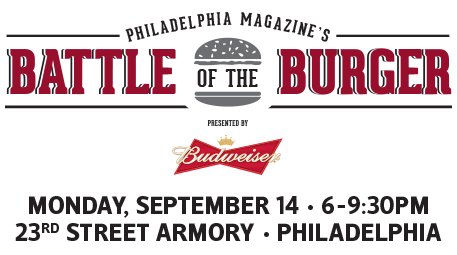 Philadelphia magazine is hosting the 3rd annual Battle of the Burger™ presented by Budweiser® and it’s up to you to crown Philly’s favorite burger! Starting July 13th, vote daily for the restaurant you want to see compete in an epic cook-off. Then come taste the top 20 burgers and cast your final vote during the live competition on September 14th! From July 13th to August 6th, Philadelphia magazine invites you to vote once a day for your favorite Philly burger. With 40 restaurants participating in the online voting competition, only the top 20 restaurants will compete live at the Battle of the Burger™ event on September 14th. BIRDS, BURGERS & BEER! Sample all of the Top 20 burgers and place your final vote for your favorite. Enjoy refreshing Budweiser® and the Eagles vs. Falcons game streaming LIVE at the Birds 24/7 Ultimate Tailgate! Be sure to purchase your ticket today and watch the Battle unfold.